Mother Nature’s way of showing you that if you calm down, you can attain beauty. Beauty of such a perfection that you will always ask yourself how it is done and how it could get like this. 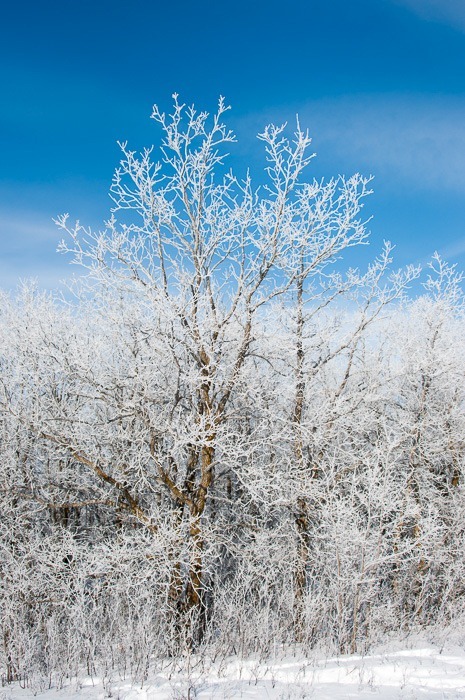 This time, I saw the hoarfrost from my balcony. Nice and white on the trees; the clouds of fog still lingering near the horizon. While I was thinking of breakfast, I also thought that by the time breakfast would be ready, that beautiful white stuff would be gone. Out with ideas of eggs and sausages and out of the house with a camera. I went south of the city, thinking of La Barriere Park for a change. But by the time I was halfway there, I noticed that there was no frost on the trees and nothing really captured my eyes to continue in that direction. So, back to the west of the city, to Beaudry Park. 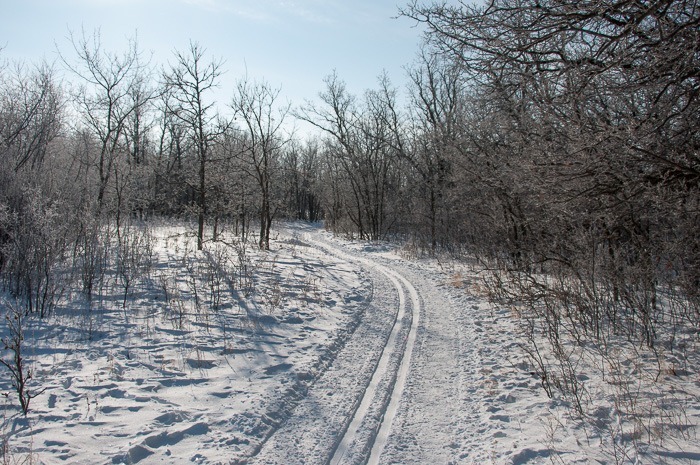 Beaudry Park at this time of the year is intensively used by cross-country skiers, skidoos and people with dogs, hounds, kids and so on. Nothing much quiet there. Unless you go there on a Sunday morning around 8:30 . Freshly groomed ski trails led the way for me to more interesting places. I did come across a few skiers, but nothing that disturbed the quiet morning. 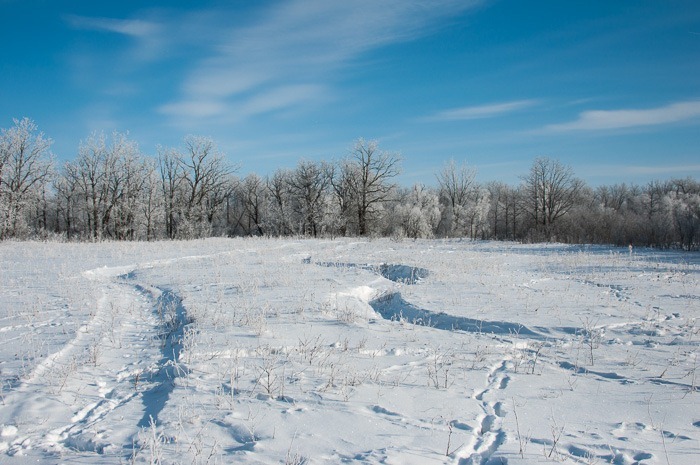 The attractive thing with cross-country skiers is that they never wander far off their trail, so the rest of the environment remains practically untouched. The only extra tracks that you find are made by animals. After all we are trespassing in their back yard, right? The tracks above made me wonder by what animal they were made. The size of those trails disturbs me. 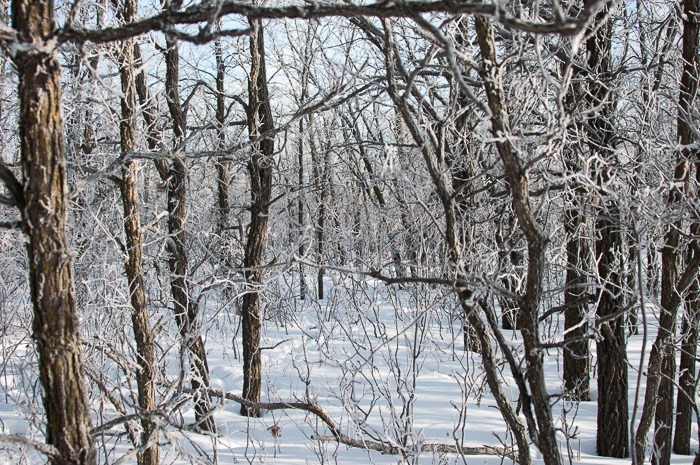 A simple view into the woods usually is not enough for me to trip the shutter of my camera. After all, I get enough pictures of tree trunks and empty branches when I am looking for some birds. 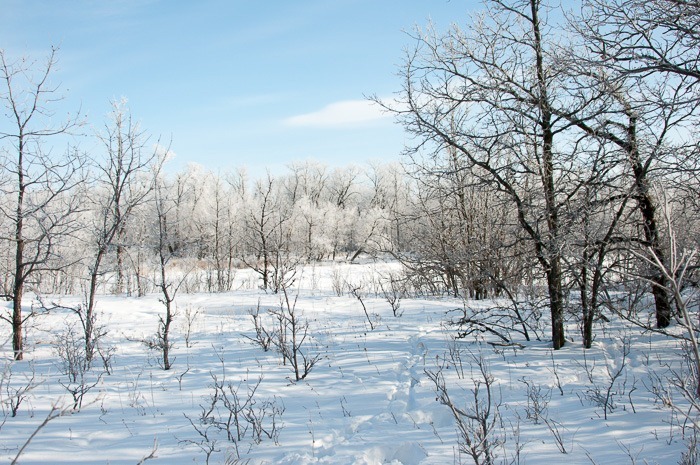 With hoar frost, however, the picture is immediately more interesting, more “contrasty”, more… well, it has something extra that you simply need to catch with your camera. 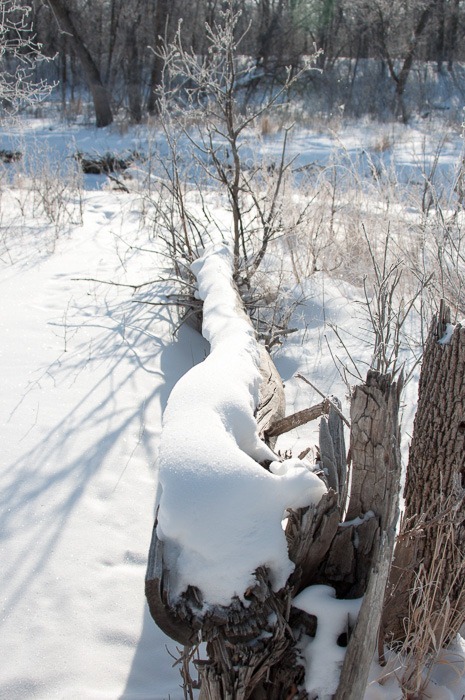 Fallen trees or felled trees by beavers take on a different view when there is some snow and hoar frost on them. The above picture looks like some old painting by a Dutch master of the 17th century. Other trunks have snow on them and you ask yourself how that snow can remain in that position without sliding off onto the ground. In fact, all of this is Mother Nature’s way to show that we need to slow down and somehow inhale that quietness she offers us. But also, you need to be aware of some traps. Not all that looks quiet is without risk. 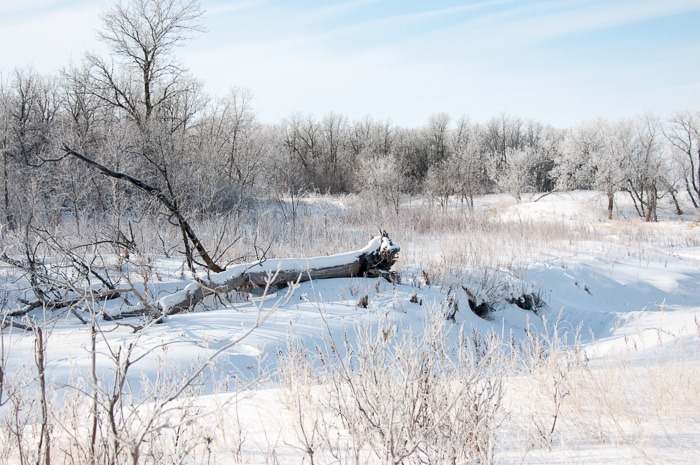 This quiet view of the Assiniboine river is very inviting for a walk. You can see all kinds of tracks of different vehicles like snow scooters, skiers and more. So I was quite surprised to get a “booter” when I set one foot on this ice. 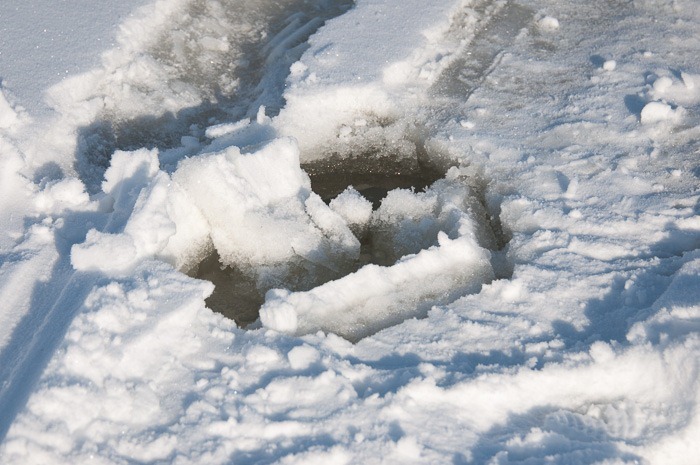 The ice was covered in snow, but underneath the river had cracked it and had pushed out water under pressure. I left the hole above behind as quickly as I could. I saw that the ice was going down, slowly but surely under my weight. Elsewhere that same ice was about 130cm thick, here, it was utterly unsafe. 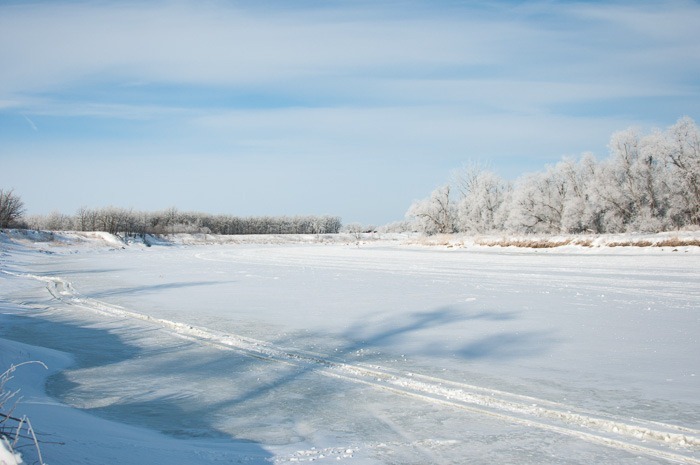 It was not until the next Monday that I learned that upstream, a water “management” company had opened the valves to release over a hundred million cubic meters of warm(er) water into the Assiniboine. Effectively ending the fun season on ice for this year. And that on the busiest Ice Weekend of the year!